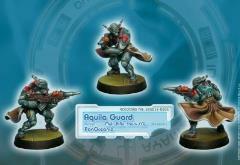 Aquila Guard. Elite Heavy Infantry of PanOceania. ‘Lead from the frontline’ is the motto of the Aquila officers, and the most characteristic Lieutenant option for the PanOceanian players has finally arrived on the battlefield. This hunter of camouflaged figures is one of the most desirable troops for PanOceanian army lists.